The tropics are home to the greatest biodiversity on the planet and provide vital climate regulation. The Tropical Futures Initiative (TFI) brings together scientists from various disciplines and institutions to help governments and key decision makers implement sustainable pathways for these important regions. In 2017, TFI succeeded in becoming the first IIASA Futures Initiative to secure significant external funding under the RESTORE+ project. The overarching objective of the Restoration for Land Use Sustainability in the Tropics (RESTORE+) project is to provide decision makers in the tropical region with lasting capacity, technical recommendations, and enhanced datasets to inform the restoration of degraded and marginal areas at the Food-Land-Energy nexus. 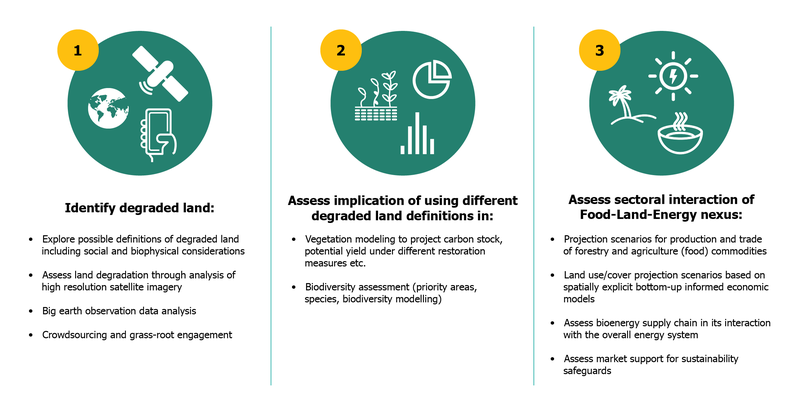 This calls for an approach that links qualitative information with socioeconomic and environmental parameters to obtain a comprehensive assessment of degradation and restoration. Beyond bridging science to policy, RESTORE+ also aims to develop a generic methodology that can be applied to other regions. To this end, while focusing on detailed assessment activities in Indonesia and Brazil, the project also covers the Congo Basin, to conduct dissemination and research outreach activities. In Indonesia, the project specifically aims to inform key national and sub-national policies such as the country’s medium-term economic development plan (or RPJMN as it is commonly referred to in Indonesia), nationally determined contribution (NDC), climate resilience strategy, and national biodiversity strategies and action plan (NBSAP). Other than quantifyable results, this requires the project to also deliver modeling tools that can be used for further analyses or related inquiries in the broader land use context. RESTORE+ aims to deliver an Indonesia specific modeling toolbox comprising detailed modeling results of the Environmental Policy Integrated Model (EPIC), the Global Forest Model (G4M), the Techno-economic Spatial Optimization Model (BeWhere), enhanced remote sensing products utilizing the citizen-sourced Geo-Wiki approach, and the Global Biosphere Management Model (GLOBIOM). The project will also allow groundtruthing for the usefulness and policy impact of IIASA’s exploratory work. In 2017 for example, the IIASA Wildfire Climate Impacts and Adaptation Model (FLAM), was applied to the Tropics for the first time, with a study devoted to the application of this model to Indonesia. FLAM captures the complex impact of climate, population, and fuel availability on burned areas, using a process-based fire parameterization algorithm that was originally developed to link a fire model with dynamic global vegetation models. The version of the model applied in Indonesia however, features new modeling approaches compared to the original model applied to Europe. As model development and assessment requires joint capacity building and close collaboration with local stakeholders, enhanced capacity in modeling and the analyses of results are also crucial outcomes of the RESTORE+ project. In Brazil, RESTORE+ benefits from the successful results of the preceding International Climate Initiative (IKI)-funded REDD Policy Assessment Centre (REDD-PAC) project. Other than generating important technical assessments that forms the basis of Brazil’s NDC, REDD-PAC also resulted in the Global Biosphere Management Model (GLOBIOM) for Brazil , and other local modeling capacities that will further contribute to the RESTORE+ project. At this stage, the goal of the project is to inform, among others, ministry regulations, and technical- and policy guidelines that contribute to the implementation or enhancement of Brazil’s Forest Code to help achieve objectives such as those in its NDC and NBSAP. In the Congo Basin, project activities focuses on ensuring that stakeholders in the region (e.g., Ministries of Forests and Environment, the Commission of Central African Forests (COMIFAC), CN-REDD offices, and Ministries of Agriculture) endorse the project in terms of its potential contribution to policy formulation and relevant stakeholder activities. Selected training activities will also be undertaken throughout the project to enhance capacity in the region. A consortium of 10 institutions led by IIASA collaborate on the RESTORE+ project. The project forms part of the IKI and is supported by the German Federal Ministry for the Environment, Nature Conservation, Building, and Nuclear Safety (BMUB).